The Delmarva Peninsula is a 220-kilometer-long headland, spit, and barrier island complex that was significantly affected by Hurricane Sandy. In order to better constrain controls on coastal vulnerability and evolution, the region’s sediment sources, transport pathways and sediment sinks must be identified. This project defines the geologic framework of the Delmarva coastal system through geophysical mapping of the inner continental shelf. Such information can then be related to the physical processes that govern coastal system evolution at storm-event and longer timescales. Similar efforts conducted in Fire Island, NY, North Carolina, South Carolina and Massachusetts have proven crucial to the assessment of coastal hazards as well as to habitat characterization and identification of cultural resources in those regions. Defining the geologic framework of the Delmarva coastal system through geophysical mapping of the inner continental shelf provides the scientific foundation for effective management of this dynamic coastal system as it responds to storms, sea-level rise, and anthropogenic activities. Geophysical Mapping and Sea Floor Sampling: Geophysical Surveys conducted during the summers of 2014 and 2015 acquired post-Sandy bathymetric, backscatter, seismic-reflection profile, sediment sample and bottom-photograph data. Exiting Dataset Compliation and Integration: The project built on recent and ongoing hydrographic, geologic, and ecological studies in the area. 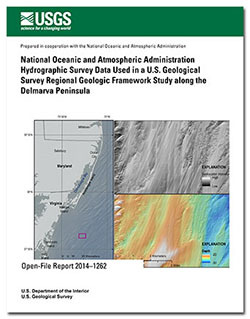 Data Releases: Bathymetric, backscatter, seismic reflection profile and sample data provide a three-dimensional, high-resolution view of the Delmarva coastal environment. Coastal Processes and Regional Collaborations: This project defines the underlying geologic framework that controls the Delmarva coastal system. Research is conducted in close collaboration with other regional studies that address the physcial and ecological processes that contribute to coastal evolution. in the near future, sediment availability and movement may be a significant constraint on natural beach response and engineering responses associated with recovery from Hurricane Sandy. Longer-term changes in storminess and sea-level rise will also affect future sediment movement and the response of beaches and dunes. The Delmarva Peninsula includes valuable national assets such as Assateague Island National Seashore, Chincoteague National Wildlife Refuge, the Eastern Seaboard’s longest coastal wilderness owned by The Nature Conservancy, as well as heavily developed coastal municipalities. Knowledge of a region’s antecedent geology, sediment type, distribution, deposit geometry, and transport pathways is lacking and is critical to addressing coastal issues. Comprehensive inner continental shelf geophysical mapping provides the data essential to fill these knowledge gaps. Similar efforts conducted in Fire Island, NY, North Carolina, South Carolina and Massachusetts have proven crucial to the assessment of coastal hazards as well as to habitat characterization and identification of cultural resources in those regions. Defining the geologic framework of the Delmarva coastal system through geophysical mapping of the inner continental shelf provides the scientific foundation for effective management of this dynamic coastal system as it responds to storms, sea-level rise, and anthropogenic activities. Clockwise: Map of Chesapeake Bay and the Delmarva Peninsula; Radar Image of Hurricane Sandy; Seismic Reflection Profile data collected offshore of the Delmarva Peninsula; Shipwreck off of Ocean City, MD imaged in side scan sonar backscatter; Bathymetric data showing sand ridges; photo of sea floor ripples. Pendleton, Elizabeth A.; Brothers, Laura L.; Thieler, E. Robert; Danforth, William W.; Parker, Castle E.
Pendleton, E.A., Brothers, L.L., Thieler, E.R., Danforth, W.W., and Parker, C.E., 2015, National Oceanic and Atmospheric Administration hydrographic survey data used in a U.S. Geological Survey regional geologic framework study along the Delmarva Peninsula: U.S. Geological Survey Open-File Report 2014-1262, 18 p., http://dx.doi.org/10.3133/ofr20141262. These data are a qualitatively derived interpretive polygon shapefile defining surficial sediment type and distribution, and geomorphology, for nearly 1,400 square kilometers of sea floor on the inner-continental shelf from Fenwick Island, Maryland to Fisherman’s Island, Virginia, USA. Map showing the tracklines and grab sample sites of the 2014 and 2015 geophysical surveys offshore of the Delmarva Peninsula. A group photo of the crew of the Scarlett Isabella. A view of the Scarlett Isabella from shoreline. The USGS returned from a seafloor data mapping mission offshore of the Delmarva Peninsula (Ocean City, MD) on July 25th, 2014. The data collected is foundational to our continued understanding of coastal change, vulnerabilities, and making our coastal communities more resilient to coastal hazards and climate change.